On the other end of the phone, actress Reshmi Soman sounds cool and confident. 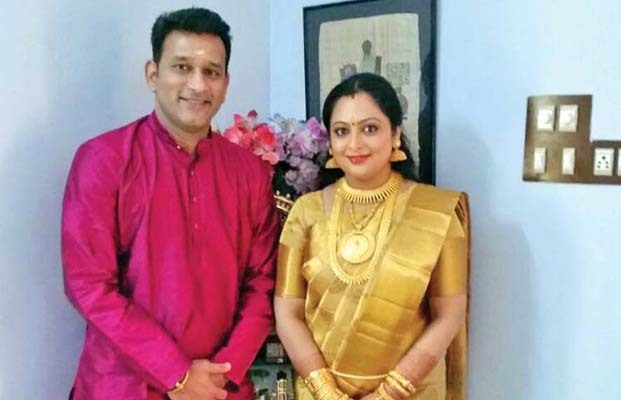 The actress who completed her Masters in Business Administration and has got married to Gopinath three months back, is quite happy about the fresh innings of her life and career. “I took a break from acting when I was at the peak of my career to pursue my studies. During that time, I had many offers to work in serials. But, I decided to concentrate on my studies. I really enjoyed my college days,” says Reshmi who believes that getting good education is essential in life. Now, she has passed her MBA with flying colours. After the short break, she first appeared in the serial Penmanasu in which she had two roles. The pretty actress is again in the limelight with the new serial Vivahitha, aired on Mazhavil Manorama at 6.30 pm on weekdays. She says she has become choosy in selecting her roles. “As a child, acting was never my prime goal. It just happened. I started doing serials almost 10 years ago. Luckily, I got good characters to portray. If people still love me, it is only because the characters I have done so far have managed to live in their hearts. I don’t want to lose that love. And hence I am choosy. I want my character to be different,” says Reshmi who acts as a college professor in Vivahitha. “My character name is Archana. She is the one who takes care of the family. This is a mature character. I chose this one as it looked different from other scripts that came to me,” she explains adding that her husband Gopinath is quite supportive. This is her second marriage and she lives with him in Dubai. “It was an arranged marriage. He is from Palakkad and works in Dubai. After marriage, I was in Dubai with him. I just came here for the shoot,” she says. After the shooting, she will go back. “He is a person who likes the television industry. He used to host shows, especially during events such as the Dubai Shopping festival. He supports me and sometimes offers suggestions,” she adds. As an actor, Reshmi was first introduced in movies. She was seen in Magrib, Ishtamanu Nooruvattom, Ennu Swantham Janakikutty, and Varnapakittu. But after a few movies, she moved to television and went on to become a popular face through hit serials such as Akshayapathram, Thaali, Bharya, Swararagam, Sapatni, Akkarappacha and Makalude Amma. “After the first few movies, many opportunities came my way. But, my family was not very interested in me acting in films. Later, Madhu sir invited me to act in the mega serial Hari, which was broadcast on Doordarshan. That marked the beginning. That was an emotionally challenging role,” she reminisces. Walking down the memory lane, Reshmi says, among the number of serials she had done so far, two serials — Akshayapathram and Thaali remain close to her heart. “These two started in just 10 days difference. Both were based on novels and turned out to be hit serials. I had read the novel based on which Akshayapathram was made. So, I had a fair idea about the character Kamala. It was a wonderful character. The character in Thaali too was a different one. I am quite happy that I got to do such powerful characters at such a young age,” says Reshmi. Reshmi feels more comfortable on the mini screen than on the big screen. “Serial is a vast area. Exposure is high. Also, nowadays, female characters haven’t got much space in films. However, the scope for women-centric roles is high in serials,” she adds.